The U.S. Davis Cup Team at the Monte Carlo Country Club. Ryan Harrison and Jo-Wilfried Tsonga play the first singles match. John Isner and Gilles Simon play the second singles match. Bob and Mike Bryan play Michael Llodra and Julien Benneteau in the doubles rubber. ROQUEBRUNE-CAP-MARTIN, France – Ryan Harrison played and won his first career Davis Cup match in February against Switzerland in a dead rubber as part of the U.S. team’s dominating 5-0 victory. And now in the quarterfinals against France, Harrison, 19, not only will be playing his first live Davis Cup rubber, but he will start off play for the U.S. against world No. 6 and French No. 1 Jo-Wilfried Tsonga Friday on an outdoor clay court at the Monte Carlo Country Club. Harrison is the U.S. Davis Cup Team’s No. 2 singles player behind No. 1 player John Isner, who plays the second singles match Friday against France’s No. 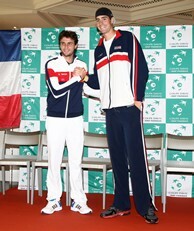 2, Gilles Simon. In the doubles rubber Saturday, the world No. 1 doubles team Bob and Mike Bryan face doubles world No. 5 Michael Llodra and Julien Benneteau. On Sunday, Isner and Tsonga play the fourth singles match with Harrison vs. Simon closing out the tie. U.S. Davis Cup Captain Jim Courier and French Davis Cup Captain Guy Forget also have the option of changing their players for the first matches up to an hour before the start of play each day. Harrison was the last addition to the team, receiving an invitation from U.S. Davis Cup Captain Jim Courier last Friday to join the team in Monte Carlo, after Mardy Fish was forced to withdraw from the tie due to health reasons. The loss of Fish and the addition of Harrison made world No. 11 Isner the No. 1 singles player and put Harrison into his first live rubber. For Harrison, the world No. 66, it did not matter if he played his first live Davis Cup match as the first or second singles match Friday, and it will be his first career meeting with Tsonga. His game starts with his big serve and forehand and having been on the bench with Courier and having had the experience of playing a Davis Cup match and being a practice partner, he knows what to expect. "I think that obviously it's something both people have to deal with," he said of the order of play. "I think either way, playing first or second, it's the same for both players and we'll both be prepared either way. "We discussed a lot of that stuff in the past," he said of getting advice from Courier. "I think we're both on the same page. We both have a very clear mindset of what has to be done in order to get the job done. We're going to try to go out and execute tomorrow." Tsonga has a stellar Davis Cup record at 12-2 and knows Harrison will come out playing his best tennis for his country in an important match for him. 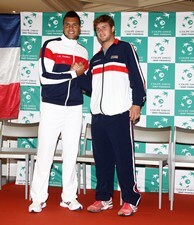 "It will be an exciting match," Tsonga said. "For sure for him it is going to be a special tie. I will try to be focused at the beginning and we will see how he will respond." Isner and Simon, the world No. 13, met just a few weeks ago at the BNP Paribas Open, which was a three-set victory for the American. However, that was a different surface and playing under different circumstances, with one an ATP Tour tournament and the other representing your country and team in Davis Cup. As a whole, Isner has been playing with a lot of confidence given his success on the ATP Tour the second half of 2011 and his great start to 2012, with wins over Roger Federer in Davis Cup and Novak Djokovic at the BNP Paribas Open. "I don't think it's going to play that much of a difference," Isner said of his recent win over Simon. "It's Davis Cup. It's a whole different animal than a regular tournament. He's going to take the court very confident. I'm going to take the court very confident. Obviously it's a different surface. Whoever plays better tomorrow is going to win, simple as that." The Bryans have been nothing short of sensational in their Davis Cup careers, with an 18-2 record together, and will be facing familiar opponents in Llodra and Benneteau, and they know it will be another tough test. "This is one of the toughest teams we'll be facing," Bob Bryan said. "Llodra has been one of our biggest rivals over the last 14 years we've been playing. Played him in big matches all over the world. This is another big one. We're expecting another tough match." It is a huge advantage for Courier to have the Bryans on his team and while it might be clichéd, it is not any less true that he expects his players to be well-prepared and compete their hardest. "Their record is extremely strong. I have the utmost confidence in them. As a captain, having them on your side, it feels like you're almost cheating, so it's great to have them onboard," Courier said of the Bryans. "I think Ryan said it best," he added. "We're going to be ready to play whenever." All matches will be streamed live on USTA.com and for free to U.S. residents and broadcast live on Tennis Channel.